Heat waves rising over a field of winter wheat in Goodland, Kan. Photo by Kristen Cart. Here is Agriculture 101. I will tell you something about wheat. There are two types of wheat. You have hard and soft wheat. Hard is considered winter wheat, whereas the soft is considered spring wheat. Winter wheat is planted in August or September. It is harvested the next summer. Spring wheat is planted in the spring, and it is harvested in August or September. There are different types of winter and spring wheat. Some will produce better yields under normal growing conditions. Our Colorado wheat fields that were just harvested will not be planted again until August 2013. Farmers leave the field idle for a year. This is done to keep the moisture in the ground, and to preserve some of the minerals for growing. Here in Colorado, it is called dry farming. When they get ready to plant, they will plant the wheat into the ground, without breaking it up. 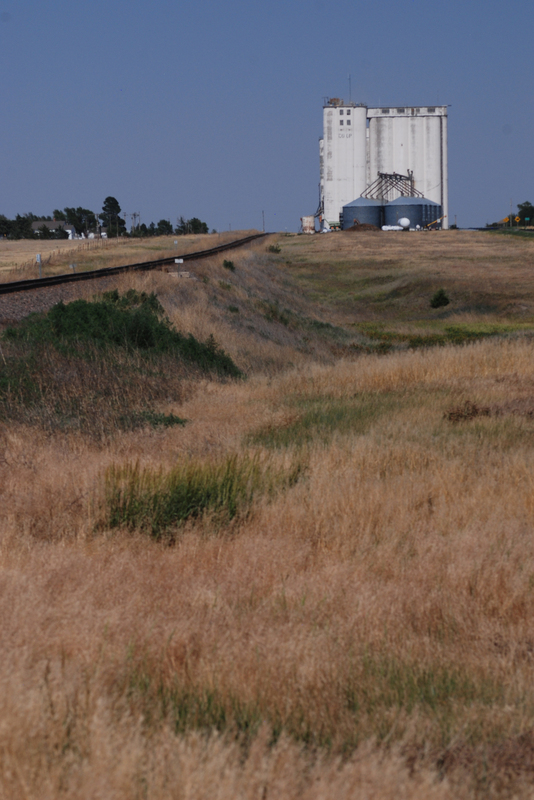 A view, two days before harvest, of the Page City, Kan., elevator, built by Johnson-Sampson Construction, of Salina. Where I was reared, in Kansas, it was wet farming. We had enough moisture, between the rain and snow. 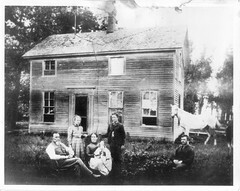 Farmers would use a plow, and plow under the last crop remains, then go back over the field with a harrow, leveling out the ground. Then they would come in with a planter and put the seeds into the ground. In Colorado, we cannot do this, as we do not have the moisture. Basically, the states that produce hard wheat are Texas, Oklahoma, Kansas, New Mexico, Colorado, western Nebraska, and South Dakota. States that produce soft wheat are North Dakota, Montana, Idaho, Washington, and Oregon. Those are just a few basic things about wheat. This entry was posted in Gary Rich Photo Pages, Miscellany and tagged Colorado Agriculture, dry farming, Gary Rich, Goodland Kansas, grain elevator, harvest, Johnson-Sampson Construction Company, Kansas Agriculture, Page City Kansas, spring wheat, wheat farming, winter wheat. Thanks for all the information. It’s so interesting. It’s nice to sit back & reap your knowledge on a subject that I grew up with. I remember Dad always worried about the crops because they determined whether his job would be successful or busy. Keep up the good work. My husband Delbert Griffith worked on elevator construction during the 1950’s and early 1960’s. In 1961, we were living in Goodland KS and Sampson Construction built the grain elevator at Edson, KS. The same company built elevators at Phillipsburg and Gretna, KS, one in Hartner Ks, and in 1958, we moved to Algona, IA where his crew completed the elevator there. Hillard Satchell was the foreman/general boss on all these jobs. Hi. I am a city boy, but here in Israel I notice that all the wheat fields have the edges cut before the harvest. Do you have an idea why that is done? No idea why they do it! But if you ever find out, please let us know. Hi, Here in Israel i notice all the wheat fields have their edges cut before the harvest.Any idea why they do that? This is speculation–is it possible that the edges are cut first because the combine is not able to harvest all the way to the edge? Any wheat farmers out there, please comment!